Yesterday, I decided to try two new foods which were part of the "must eat" list in my healthy detox program. The first was an artichoke. 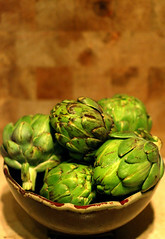 I've had artichokes plenty of times, but not in their pure form. I've eaten them smothered with all kinds of cheese in some sort of dip; I've also had the oil & salt laden marinated artichoke hearts, which are quite yummy. But this was my first venture into cooking and consuming a plain old artichoke. Artichokes are really neat looking, but they're also intimidating. When I bought one, I felt instantly cool, but then I swore the cashier was looking me over, like "Does she have any idea what to do with this?" Anyway, I discovered that an artichoke is actually pretty delicious. I thought the dip would be key, but I almost liked it better without the dip. It felt so good to be truly enjoying something that was good for me in it's plain, unadulterated form. When dinner rolled around, I was on a health food high--and thinking that my idea of stirring some kale into my pre-packed smoked salmon & white bean soup would be a good one. It wasn't. The soup was delicious...the kale tasted like, well, kale. It's kind of a dense, bitter green which needs to be cooked so that it'll soften and the bitterness will fade. I've never been one for cooked greens, so maybe I'm destined to hate it no matter what, but it definitely wasn't tasty. I guess one out of two isn't too bad. Oooh...didn't think of soy sauce. I will have to give it another try that way. I know I shouldn't mention this on such a health conscious blog but I have the recipe for Suppe Tuscana from Olive Garden, the potato soup with kale and it's delicious in there. That is a chicken broth based soup with some cream and it does simmer with the kale for a bit. But I agree, take out the stems.